For courses in Success/Orientation, Diversity (ie. Managing Diversity), Race and Ethnic Relations, Cultural Diversity in the Workplace, Multiculturalism and Inclusion (ie. leadership, group dynamics, teaching, social media/networking), Education, Nursing, Human Relations, Communications, Hospitality, Social Work/Family Therapy/Human Services, EMS and Fire Science, Counseling, Criminal Justice, Social Justice/Equity; also for teacher-training education courses, and staff/professional development workshops. This work on human diversity integrates personal and organizational perspectives, research, and theories while discussing teamwork, communication, leadership, conflict, social networking, and other issues in the workplace, at school, and in the community. Diversity Consciousness empowers students by helping them develop a "mind-set" which will enable them to be more successful in the 21st century. MyStudentSuccessLab (www.mystudentsuccesslab.com) helps students to 'Start strong, Finish stronger' by acquiring the skills they need to succeed for ongoing personal and professional development. · Personalized Learning with MyStudentSuccessLab: Whether face-to-face or online, MyStudentSuccessLab helps students build the skills they need through peer-led video interviews, interactive practice exercises, and activities that provide academic, life, and professionalism skills. · Personal and Professional Relevance: Ignites student’s curiosity and questions about the nature and critical importance of diversity and diversity consciousness to off-set passive learning. · End-of-Chapter applications: Reinforces learning and develops diversity consciousness through real-life case studies, thought provoking questions, and a variety of activities (ie. experiential , online, research-oriented). Challenges students to examine their beliefs in a supportive context. · References and Research: Empirically grounded; integrates current research studies and data throughout. Dr. Richard Bucher is a Professor of Sociology at Baltimore City Community College (BCCC). He has been nationally recognized for his teaching excellence and teaches a variety of courses, including Introductory Sociology, Cultural Diversity in the Workplace, and Race and Ethnic Relations. Among his awards, the Carnegie Foundation for the Advancement of Teaching and the Council for Advancement and Support of Education honored him for extraordinary dedication to teaching. He served as the first Director of BCCC's Institute for Intercultural Understanding (IIU). Under his leadership, the IIU gained national recognition as an innovative diversity education program. Dr. Bucher received his Ph.D. in Sociology from Howard University, with a concentration in race and ethnic relations. He is also the author of Building Cultural Intelligence (CQ): Nine Megaskills (Prentice Hall, 2008). 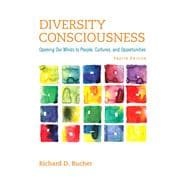 We encourage you to visit his website at http://www.diversityconsciousness.com and this Blog on the subject of diversity consciousness/cultural intelligence at www.diversityconsciousness.com/blog The author driven Blog is for faculty and educators who want to learn more about diversity and how it impacts their institutions, their communities, and their teaching.